Hi everyone, I hope you’re having a wonderful Christmas season this year!! Today the Int’l Bloggers Club is sharing with you all our Christmas projects and also some customs we have for this time of year. I hope you enjoy reading all about our different holiday traditions. I will be sharing some of my family’s Christmas traditions as well as giving instructions on How to Stencil a Throw Pillow. A few months ago, I stenciled 2 pillow cases for our fall Int’l Bloggers Club post. It was my intention to do 2 more for Christmas, but *sigh* I just couldn’t make myself sew 2 throw pillows, so I made 1 pillow and stenciled this pretty little tree on it that I designed. I’m making this stencil file available in the Resource Library which is an email subscriber bonus. I simply made an envelope pillow case out of drop cloth using this tutorial from Love Grows Wild. A book was placed inside the pillowcase to give a somewhat firm surface under the fabric, and I also didn’t want any of the paint to bleed through to the back. I stenciled this Christmas tree stencil I designed a few months ago. The stencil was cut using my Cricut Explore. Speaking of Christmas traditions. Did you see how I smoothly made that transition? lol. Since being married, my little family usually spends Christmas at home in Missouri. We open presents early on Christmas morning and then around lunch time we have a potluck lunch at my in-laws’ homes. One year we tried to spend Christmas with both our families, but splitting our time proved too crazy. Oh another fun tradition my little family has is that each year my girls choose one ornament from the store, and my husband and I choose one together. The ornament you see next to the pillow is one of my daughter’s ornaments. I write their names and the year on the ornament they pick out. That’s the only Christmas ornaments we buy, and I’ve made a few ornaments here and there over the years. My mom has made some ornaments for us too, and we have a few that were gifted to us. Here’s the wood sign I whipped up in just a few hours, drying time included. This was a simple sand, paint, stencil, sand, and wax job. The SVG JPEG stencil cut file for this stencil can be found in the Resource Library. Don’t forget to check out Mary’s, Pili’s, Michelle’s and Katrin’s Christmas traditions and projects!! 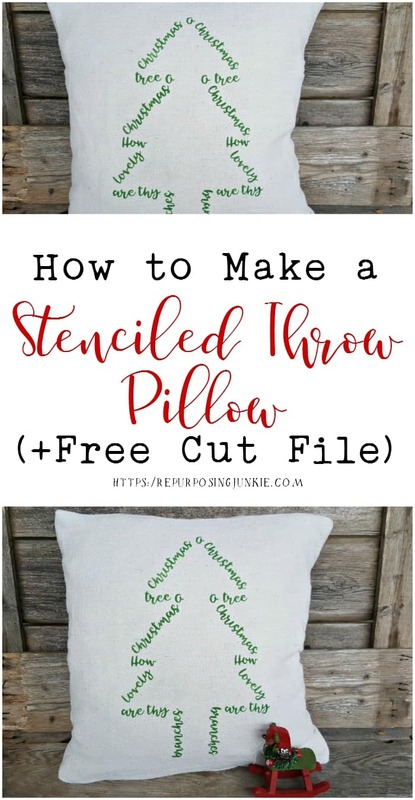 Thanks for sharing this post, How to Stencil a Throw Pillow !! Oh Keri the pillow is so pretty and so you! Love the writing on it too, it is much more than just a tree. And the saying on the wood sign is beautiful as always. Now about that pizza for Christmas eve. I’m coming over!! I t hink we may want to start a new tradition! Less cooking for mom. Hah! I wish you and your family a very merry and blessed Christmas! Thanks so much Mary!! Yes come on over!! We would love to have you!! Yes exactly less cooking, which in my book is always a good thing. 😉 Merry Christmas and a Happy New Year to you dear friend!! Hi Michelle, I hope they pass on some of our traditions when they have families of their own. I hope you have a very Merry Christmas and a Happy New Year sweet friend!! Collecting ornaments each year is a wonderful way to keep memories. I imagine when your girls are older and they have a look at all of them, good times will come back to their memory. Enjoy family time and have a Merry Christmas! Hi Pili, yes I hope this will be a lovely tradition that they keep going in their families too. Merry Christmas to you and yours dear friend!! Pizza on Christmas eve sounds like fun Keri! We usually do a duck or roastbeef or something similar but I am seriously considering pizza now! It can be hard to get all the family members into one Christmas, hey? But it sounds like so much fun!! Your pillow is so lovely, I really love “Oh Tannenbaum” Oh Christmas tree”, one of my favourite Christmas songs! We’re pretty excited about joining my family this year for our pizza Christmas Eve tradition. My girls can’t wait to see the animals on the farm too. Thank you so much for your kind words! I hope you have a very Merry Christmas and a Happy New Year Katrin!! I forgot to mention the beautiful sign Keri, I love it, your stencils are the BEST!! Keri, your Christmas tree pillow is adorable! Love that drop cloth material too! You speak of such sweet family traditions…it’s a good thing you aren’t trying to be 2 places on Christmas day! Whew! It would make an exhausting holiday out of it! The happiest of Christmases to you! kERI, i ADORE THE Christmas PILLOW YOU MADE – PINNING TO SHARE. i LOVE YOUR TRADITION OF PICKING OUT ORNAMENTS AND WRITING THE YEAR ON THEM. wHEN YOUR CHILDREN ARE ALL GROWN, YOU/THEY WILL CHERISH THESE MEMORIES. mERRY cHRISTMAS TO YOU AND YOURS! Thanks so much Marie!! We have fun picking out ornaments each year, for sure. I hope it makes sweet memories for them, and that maybe they’ll pass it on to their kiddos someday. Merry Christmas and a Happy New Year to you and yours as well!! What a beautiful pillow, i enjoy seeing everyone project from all over the world.